In Arts Funding, it seems we've fallen behind the guy in Uzbekistan who boils folks in oil. In fact, despite their ongoing obsessions with ethnic cleansing each other, even the Balkan countries as a group award greater financial and official support to the arts than does the U.S. Furthermore, we've slid off the "civilized country" list of arts supporters altogether, outpaced by genociders & oil boilers alike... and European allies whom we taunt as being inferior to us. By now, we've all seen the harrowing charts & figures that show how badly wealth has shifted in our country—the gut-wrenching facts that the richest 1% now own fully 40% of the nation's wealth, the the certainly-well-off-next-19% have grabbed the next 53% of wealth and that the bottom 80% of us are left to fight over that final, whopping 7% of the nation's assets. And that's where arts funding comes in. Laying aside the battle of overall Income Inequality for a moment, it's critical to focus on just how the 100% decides to divvy up that last 7% for the 80%—with full understanding that the 20% (i.e., the .001% & their aspirational cronies) have the self-interest, power and means to dictate exactly how that 7% is apportioned. And, as usual, the first victim of what the powerful need is art. If, indeed, "research shows that art studies close the gap between high- and low-income students and not only improve numerical skills but promote creativity and social development," well, the rich simply can't allow that. It's no great leap that art itself poses a severe threat to those who wish a pliant citizenry; one that will accede to the beneficence of their betters. It's difficult to assert that you know what's best for someone if he or she is out-thinking and out-conceptualizing you at every turn. This is exactly what art and art education offers the population—the ability to think and conceptualize for ourselves; weighing facts and concepts, coming to our own conclusions. Worse for the powerful, art allows us to process the statements of others who hold varying perspectives on what we've all seen and heard, and perhaps not fully understood. In short, art is the loose canon that simply cannot be allowed in a hierarchical state. Hence, Leave It To Bieber. Once the rich through their corporations control the means of communication, their ideas of art become accepted dogma. Justin Bieber, Dancing With The Stars, video games, pop novels, year-round summer movie blockbusters and the AOL-anization of Internet content become culture. The Art of Distraction becomes paramount as consumption replaces consideration. Reducing access to art becomes the prime directive. Non-pliant voices are to be crowded out, choked, with no resources feeding them. Thus, when those unfortunate charts about silly things like Haves and Have Nots bounce around the Internet, few will see them; and those who do won't understand what they're seeing or have any idea about how to change things. And the pliant will be depended upon to disparage the few who do see, and harass them into the shadows. 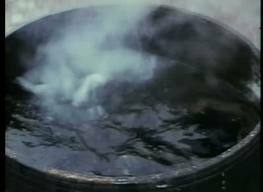 This way, opposition is boiled in oil; financial cleansing is fully achieved. With no art to rear its ugly head. As this is the ultimate local issue, the school district—and the local, county and state legislative body—is where this battle will be waged. It's up to those who need and believe in arts programs and arts education in their schools and towns to stand and embrace the battle to restore these precious programs, as the first important step in helping build the national groundswell for the battle to replenish a proper federal investment in the arts.